Tools for Action is the collective name of a series of inflatables modeled on everyday objects, the dimensions of which have been scaled-up to gigantic proportion. Used mainly in interactions during protests and public gatherings, these objects adopt the form of a range of items, including huge pavement bricks, rainbows, icebergs, or hammers (see: artistic competence). Simple to build, they can be created with a manual; once unleashed, they prove difficult to stop. A special feature of the inflated tools is their power to transform a fiercely violent and confrontational situation into an event not far-removed from a fun activity or a game (see: making use). Therefore a Tools for Action tool is perfect for a riot or demonstration. They modify the choreography of a protest, lending a new dynamic to public interactions, while transforming the aesthetic of protest. They make a sudden appearance as conspicuous objects that build a community of users (see: coefficient of art). Mobile, distinctive, and useful, they are extremely fit for their function – to demonstrate resistance. 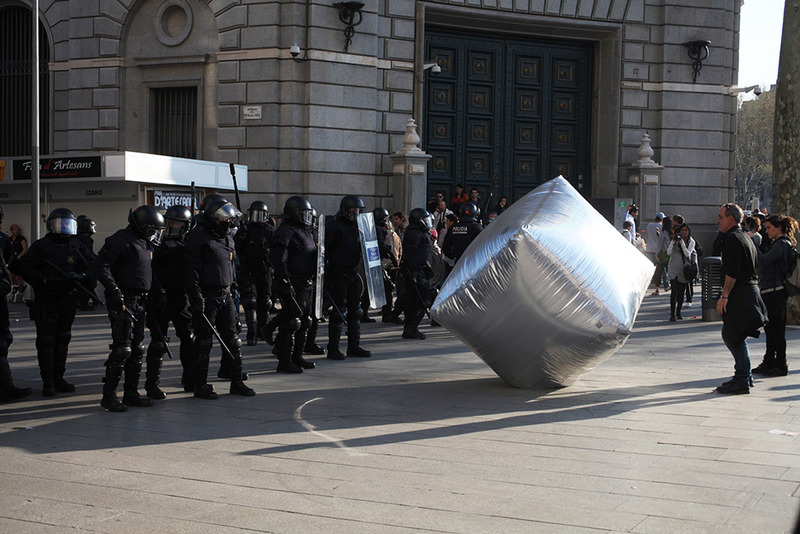 The report presented in exhibition consists of an inflatable cube loaned to the Museum of Modern Art in Warsaw for the duration of the exhibition. Courtesy Artúr van Balen.